10/19/14 Who is Greater Than John the Baptist? Now, consider Abraham for example. Paul calls him "the father of all those having faith"; and "those who adhere to faith are the ones who are sons of Abraham." (Rom. 4:11; Gal. 3:7-9, 26, 29) What do you think, was Jesus saying that we are all greater than Abraham, whose sons we are if we have faith like his, because we gave a fellow Christian something to eat when we saw him hungry, or a drink when he became thirsty? Did Jesus mean that a person will forever perish simply for failing to come to the aid of another Christian? (Matt. 25:35, 41,42) Clearly there is something lacking in this understanding regarding the identity of Christ's brothers and the meaning of the illustration. For further information on this subject, please see "Who Are Christ's Brothers?" on this website. 10/8/14 Why do the Wicked Among God's People Prosper? When King David sinned in connection with Bath-sheba, taking another man's wife, he did not escape punishment, although Jehovah forgave him because he repented. David suffered long-lasting consequences, including a revolt against his kingship by his own son, Absalom, who forced David to flee for his life. Eventually David was restored to his throne and Jehovah again blessed him. (2 Sam. 11:2-5; 12:7-14; 15:1-6, 13,14) King David certainly did not prosper when he sinned. Perhaps you yourself are aware that Jehovah has not exempted you from punishment on account of a sin you became guilty of; yet you have reason to be encouraged. Consider what happened to a brother whose business trips took him away from his family for days at a time; and on one of those trips he succumbed to temptation as David had. And like David, he wanted to keep it hidden. Then, within a few months his company downsized and he lost his job. Not being able to find another, his wife felt compelled to go to work, moving back to her parents and former hometown where she had worked before she was married. This had consequences on their marriage and she became estranged from her husband, who at this point came to realize that the turn of events was no coincidence. He confessed his sin to Jehovah, begging for his forgiveness, and shortly after found another job. He realized that he still had to settle matters with his wife and ask for her forgiveness. 8/24/14 "The false prophets are making my people become vain"
How do you feel about the condition of your congregation? Do you enjoy attending the meetings because of the peace and brotherly love that is there? That is what Jehovah and Jesus want for us, and that would be the case when we listen to them. On the other hand, there is "no peace for the wicked ones." (Psalms 29:11; 119:165-168; Isa. 48:22; Rev. 2:4) When joy and peace are lacking among God's people it is evidence that Jehovah's spirit is missing, for both are fruits of the spirit. (Gal. 5:22; Rom. 15:13). At the meetings and in our publications, we have heard much about the supposed peace and the "spiritual paradise" that God's people are said to enjoy in this time of the end. We are assured that our obedience to the elders, who in turn have been loyally submissive to the "faithful and discreet slave," has made this peace within the congregation and with God possible. A recent Watchtower article said: "Even now in the Christian congregation, we have peaceful conditions. Indeed, we are enjoying a true spiritual paradise. We have peace with God and with our fellow man. Note what Isaiah prophesied about the conditions that we are experiencing today: 'They will have to beat their swords into plowshares and their spears into pruning shears. Nation will not lift up sword against nation, neither will they learn war anymore.' (Isa. 2:3, 4) By acting in harmony with God’s spirit, we contribute to the beauty of the spiritual paradise. "―w09 4/15 p. 32 par. 18. "This is what Jehovah of armies has said: 'Do not listen to the words of the prophets who are prophesying to you people. They are making you become vain. The vision of their own heart is what they speak—not from the mouth of Jehovah. 17 They are saying again and again to those who are disrespectful of me, ‘Jehovah has spoken: “Peace is what you people will come to have.”’ And [to] every one walking in the stubbornness of his heart they have said, ‘No calamity will come upon you people.’ 18 "For who has stood in the intimate group of Jehovah that he might see and hear his word? Who has given attention to his word that he might hear it? 19 "Look! The windstorm of Jehovah, rage itself, will certainly go forth, even a whirling tempest. Upon the head of the wicked ones it will whirl itself. 20 The anger of Jehovah will not turn back until he will have carried out and until he will have made the ideas of his heart come true. In the final part of the days you people will give your consideration to it with understanding. 21 “I did not send the prophets, yet they themselves ran. I did not speak to them, yet they themselves prophesied. 22 But if they had stood in my intimate group, then they would have made my people hear my own words, and they would have caused them to turn back from their bad way and from the badness of their dealings.” ―Jeremiah 23:16-22. 8/16/14 Is It Service or Sacrifice? Perhaps it would sound strange if we were to refer to the preaching work as our "sacrifice" rather than "service." But if we are doing it for the Society, rather than for Jehovah, then I guess we are indeed "serving" the interests of the Society by placing their literature. 8/1/14 Why No Exemption From Punishment? How can it be said that Jehovah is "merciful and gracious," and yet refuses to pardon "error and and transgression and sin", even to the fourth generation? Paul answers that "every transgression and disobedient act received a retribution in harmony with justice." (Heb. 2:2) Not only is Jehovah a God of love and mercy, but he is also a God of justice. Perhaps we fail to see the benefit of God's justice when we are the recipient of his punishment. Some sins and transgressions are clearly more serious than others, for they may affect not only us and our immediate family, but even our offspring for several generations, such as in the case of adultery when it results in divorce. We should not expect Jehovah to shield us from the consequence of our sins. If we have become guilty of a serious sin, can we ever worship Jehovah again with a clean conscience? Is it enough for you to know that Jehovah has forgiven you? Will forgiveness alone cleanse your conscience? Suppose a man committed a serious crime a long time ago, and he seemingly got away with it because he was not caught and the trail leading to him has gone cold. If he has a conscience, will it ever allow him to have peace? He will always be looking over his shoulder, for until his crime has been dealt with there is no closure for him. The point being, he has not paid for his crime and therefore his conscience has not been absolved of his criminal act. It is different with the man who has been brought before a judge and had a penalty imposed on him, whether a fine or imprisonment; for once he has paid his debt he can continue to live his life without his conscience smiting him. "It trains us to reject ungodliness and worldly desires and to live with soundness of mind and righteousness and godly devotion amid this present system of things, while we wait for the happy hope and glorious manifestation of the great God and of our Savoir, Jesus Christ, who gave himself for us to set us free from every sort of lawlessness and to cleanse for himself a people who are his own special possession, zealous for fine works.―Titus 2: 12-14." 7/20/14 How Safe is Your Treasure in Heaven? Responding to Jesus' words, many of God's people have been motivated by an appreciative heart to devote their entire life to "seeking first the kingdom," rendering "sacred service" to God by engaging in the "holy work" of preaching the "good news of the kingdom", and often doing so far from their home in a foreign country where they had to learn its language. They relinquished the opportunity of pursing a career by which they could have build a comfortable life for themselves and their family. (Matt. 6:33; 24:14; 28:19,20; Rom. 15:16; Rev. 7:15) The question that many are asking themselves at this time, though, is: Since I spent my entire life accumulating treasure in heaven, and seeing that now in my old age I am poor in material possessions, how secure is my treasure in heaven? Can I lose it all through one act of indiscretion and sin? Jesus assures us that there is no safer place for our treasure―our relationship with God―than in heaven. No one can rob you of it, and it will never ever diminish in value as may happen in the case of earthly treasures, such as when keeping your hard earned money in a trusted bank, as was recently reported (July 13) in a Financial newspaper, which said: "Bank of Cyprus customers whose deposits were seized as part of an extraordinary move to rescue the island from financial collapse are cutting their losses and selling stakes in the bank at discount. Last year, thousands of customers with money in Bank of Cyprus, including many British and Russians, became unwilling shareholders in the lender when their deposits were turned into equity as part of a controversial €10bn emergency rescue." Due to being skinned and mistreated, many sheep have come to the conclusion that Jehovah doesn't have an organization, his sheepfold. (Psalms 100:3; John 10:1) The reality is quite different―for he does, but it has been hijacked by terrorists who have put outrageous demands on the passengers. These selfish hijackers want to fly the plane to a destination of their own choosing, assuring the passengers that it will be a destination of "peace & security." The passengers need not fear them, the plane under their control is secure, a flying paradise. Even though these terrorists think they are in control of flying the plane, they are not; they are merely delusional, drunk with narcissistic power, so focused on their own abilities and not appreciating their lack of qualifications that they haven't been relying on the planes instrumentation to discern their true course! (2 Thess. 2:9) Unbeknown to them, the plane has been on auto pilot the whole time, God's holy Spirit, and directed by the control tower manned by none other - Jesus Christ, flying the terrorists to a destination they are not expecting. When the plane lands these terrorists will be ejected and the qualified pilots put in the cockpit to fly the plane and its passenger's to the true holiday destination. (Luke 12:45,46) ―Contributed. Few people give consideration to the amazing conscience with which man was created. A good conscience serves as much of a protection to your mental and spiritual health as does the skin protect you against dangerous diseases by preventing pathogens such as a virus, bacterium, prion, fungus or protozoan, from entering your body. The primary reason people reject God is not due to the teaching of evolution, which does away with the need for God, but on account of conscience. (Psalms 53:1-5) A healthy conscience serves as a powerful deterrent to wrongdoing. When violated it can fill a person with fear, anxiety, terror, sleeplessness, even drive some insane and to suicide. (Psalms 38:4-10, 18; Rom. 2:14,15; 1 Tim. 1:5, 19; 1 Peter 3:16) In order to "hide" from God, as Adam tried, they simply deny that he exists, hoping in this manner to neutralize or shutdown their conscience altogether, including any dread that might result from their violated conscience. Is this to their benefit? Do they not realize that it robs them of a purposeful life and peace? To help them cope, many turn to alternative means in their search for feeling good or to deaden their pain, including drugs and other causes of addiction, from which they would in better times have stayed far away. They violate their other amazing protective armour, their skin, by puncturing it with poison containing needles, sometimes with fatal results. The outcome from these substitute sources of happiness often result in loss of self-respect; broken marriages; destroyed families; unemployment and poverty; homelessness; and in extreme cases prostitution; robbery; and murder; resulting in a loss of freedom when imprisoned. That is not the road to happiness! That is not what our Creator wants for us. How did matters change for God's people under the new covenant, with Jesus as their only King and Leader? (Matt. 21:4,5; 23:10; Rev. 1:5) After Jesus' ascension to heaven they were again without a visible king. Did his disciples then choose someone to sit in for Jesus in his absence, such as a body of governors like the Jews had with their Sanhedrin, one that would exercise authority over the congregations and keep them united? No! Jesus was still their only head, now sitting at God's right hand in heaven, yet very much involved in the congregation affairs by means of the holy spirit. (Heb. 8:1; Acts 13:2-5; 1 Cor. 11:3) Jesus had also appointed twelve of his disciples, whom he called apostles and to whom he gave authority, to carry on after his ascension. (Luke 6:12-17; 9:1,2; Rev. 2:2) Although many persons presented themselves as having apostolic authority (see Revelation 2:2), yet Jesus did not recognize any of them, certainly not a governing body. That is also evident from the fact that Jesus addressed his letters to the Seven Congregations directly. (Rev. 2:1,2, 8, 12, 18; 3:1, 7, 14) The governing body, the Sanhedrin, actually sat in opposition to true worship, much like the wicked kings had done. They rejected the Messiah and persecuted his followers. Their system of worship came to a sudden end when it was destroyed in 70 CE by the Roman armies. The account in Genesis describes the flood waters as covering “all the tall mountains that were under the whole heavens.” (Gen. 7:19) Some have wondered, where did all that water come from? Insight on the Scriptures explains: "The Genesis account of creation tells how on the second 'day' Jehovah made an expanse about the earth, and this expanse (called “Heaven”) formed a division between the waters below it, that is, the oceans, and the waters above it. (Ge 1:6-8) The waters suspended above the expanse evidently remained there from the second “day” of creation until the Flood. This is what the apostle Peter was talking about when he recounted that there 'were heavens from of old and an earth standing compactly out of water and in the midst of water by the word of God.' Those 'heavens' and the waters above and beneath them were the means that God’s word called into operation, and 'by those means the world of that time suffered destruction when it was deluged with water.' (2Pe 3:5, 6)"― it-1 pp. 609-610 Deluge. The waters that were suspended above the atmosphere at that time protected the planet against the seasonal extremes, making the whole earth a pleasant tropical paradise. With the collapse of the water canopy came a drastic change in earth's climate, plunging the polar regions into instant deep freeze, which scientists have tried to explain with their theory of the ice age. You may rightly ask, if there was such a vastly different climate on the earth at one time, should there not be some evidence of this? "Greenland was once upon a time a tropical country. That is proved absolutely by the remains of an extensive tropical flora which are found there. Where now a sheet of solid ice over a mile thick covers mountain and valley, and mighty frozen rivers called glaciers make their way to the sea and hatch icebergs, there was in earlier days a verdure-clad wilderness of luxuriant vegetation. Together with the palms and tree ferns, there were trees related to the giant sequoias of our own west coast; also representatives of the "gingko," the sacred tree of Japan and of the Eucalyptus family, which today is restricted to Australia. Climbing vines festooned the trunks of these monarchs of an ancient forest with draperies of foliage, while close to the ground grew those curious dwarf trees called "cycads," somewhat resembling palms in miniature, in the midst of a tangled undergrowth of ferns and other flowerless plants that carpeted the densely wooded areas. . .
"All the evidence seems to point to the conclusion that climates all over the world in that ancient epoch were pretty much the same. The same plants grew contemporaneously in Greenland and in California, in Spitzbergen and in Virginia. There was a uniformity of vegetation in all parts of the earth. Nobody can say just why this was, although several theories have been advanced to account for it. One theory is that the atmosphere in those days was heavily charged with watery vapor, so that warmth was readily distributed through it, and the sun's rays did no have a chance to strike the earth uninterrupted, making differences in climate by the degree of their slant. In the course of time the atmosphere thinned gradually, and then there can [sic] to be climatic variations marking a series of zones around the globe." The article, "When Antarctica was a tropical paradise," in The Guardian, said something similar regarding the Antarctic continent: "Antarctica is the coldest, most desolate place on Earth, a land of barren mountains buried beneath a two-mile thick ice cap. Freezing winds batter its shores while week-long blizzards frequently sweep its glaciers. Yet this icy vision turns out to be exceptional. For most of the past 100 million years, the south pole was a tropical paradise, it transpires. 'It was a green beautiful place,' said Prof Jane Francis, of Leeds University's School of Earth and Environment. 'Lots of furry mammals including possums and beavers lived there. The weather was tropical. It is only in the recent geological past that it got so cold." We have often been reminded in the publications of our responsibility toward the poor among God's people. One article recently said: “'If you love those loving you, what reward do you have?' asked Jesus. 'Are not also the tax collectors doing the same thing? And if you greet your brothers only, what extraordinary thing are you doing? Are not also the people of the nations doing the same thing? '” (Matt. 5:46, 47) True Christians do not show partiality toward people of certain educational or ethnic backgrounds; nor do they extend love only to those who are able to reciprocate. Rather, they help the poor and the sick, the young and the old. In such ways, Christians can imitate Jehovah’s love and thus be perfect in a relative sense." (w10 11/15 p. 22 Questions From Readers) What is the situation in your congregation? 5/4/14 Nicodemus Was not "Without God" or a "Stranger to the Covenant of Promise"
We are all born into sin and death. That is why Jesus came, in order to buy back for us what Adam lost―the right to life. The apostle Paul explains: "For since death is through a man, resurrection of the dead is also through a man. For just as in Adam all are dying, so also in the Christ all will be made alive." (1 Cor. 15:21,22) Are we "born again" when we are "made alive" in the Christ? The Jews certainly were not "dead in their trespasses and sins," and neither were they "strangers to the covenant of the promise," with "no hope" and "without God," as was true of the Gentiles. According to the Law covenant that God had made with his people Israel at Mount Sinai, with Moses as the mediator, the prescribed animal sacrifices made forgiveness of their sins possible, and thus they were alive to God. (Luke 20:37,38) In fact, it was through the Jews that there existed hope for all the nations who were without God, according to God's promise to Abraham. (Gen. 18:18,19; Rom. 3:1,2; Gal. 3:7-9) No, Jesus was not talking about a spiritual rebirth when he told Nicodemus of the need to be born again. That the term born again does not refer to a spiritual rebirth is emphatically made clear by the apostle Paul when he condemned the two apostates, namely, Hymenaeus and Philetus, who were denying the physical resurrection that Jesus taught, and turned it into a spiritual resurrection, a spiritual rebirth. (John 5:26-29; Acts 24:15) This later developed into the "born again" doctrine as it is being popularly taught in many churches. Paul foretold that "their word will spread like gangrene," for they were succeeding in subverting the faith of many who listened to them. Ahab was king over the ten northern tribes of Israel in Samaria, and although he was an apostate Baal worshiper Jehovah had given him two decisive victories over the far superior armies of the Syrian king Benhadad and the thirty-two kings who had aligned themselves with him. (1 Kings 20:1-34) The victories must have emboldened king Ahab, perhaps drawing the mistaken conclusion that Jehovah was with him, because after three years he decided to war against Syria in order to retake Ramoth-gilead, which was still in the hands of the Syrians; and so he invited good king Jehoshaphat of Jerusalem to accompany him into battle. But before Jehoshaphat agreed, he requested that Ahab first inquire of Jehovah. This account is of special interest to us today because it helps us understand the apostle Paul's words regarding the foretold developments among God's people during the last days, when there will exist an apostasy within God's temple; for like king Ahab, a "man of lawlessness" will elevate himself over God's people, even above the holy ones ("objects of reverence"), "showing himself to be a god" who wants to be worshiped and obeyed. Paul explains that "his presence is according to the operation of Satan with every powerful work and lying signs and unrighteous deception for those who are perishing, as a retribution because they did not accept the love of the truth that they might be saved." As was true in Ahab's case, there are those among God's people who don't want to hear the truth, for they will listen only to what they want to believe. And in keeping with their desire, "God lets an operation of error go to them, that they may get to believing the lie, in order that they all may be judged because they did not believe the truth but took pleasure in unrighteousness." (2 Thess. 2:3-12; John 8:43-47; 1 Cor. 6:19; 2 Tim. 3:1-7; Jude 3,4, 8) Ahab's false prophets of Baal far outnumbered the prophet of Jehovah, and he was kept in detention. Should we expect it to be any different today? Enclosing the face of the throne, Spreading out over it his cloud. He has described a circle upon the face of the waters, To where light ends in darkness." "The line that separates day and night is called the terminator. It is also referred to as the "grey line" and the "twilight zone." It is a fuzzy line due to our atmosphere bending sunlight. In fact, the atmosphere bends sunlight by half a degree, which is about 37 miles (60 km). It is commonly thought that while half of the Earth is covered in darkness, the other half is covered in sunlight. This is actually not true because of the bending of the sunlight results in the land covered by sunlight having greater area than the land covered by darkness. 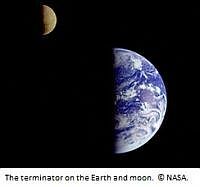 This is a picture of earth’s (and moon's) terminator. The interesting thing is, this phenomenon is only visible from space. It cannot be seen by standing on the earth’s surface. So, how could Job have known this?